A New Mac Tip Every Day: Webcams in Lighthouses?? I have to say that I was very surprised to find this widget at first. I didn't know that many lighthouses have webcams that broadcast on the internet. The widget called Lighthouse Cams will let you view the lighthouse webcams from around the world. 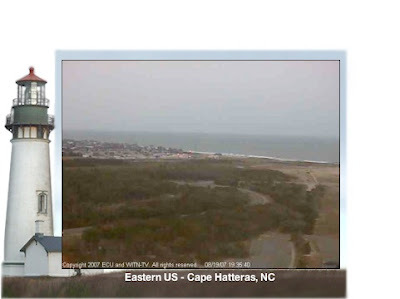 A few of the lighthouse webcams seem to be out of order, but most are working. You can easily choose how often you want it to update. You can leave it at thirty minutes because it will reload automatically when you launch dashboard anyway. It isn't the most useful widget, but it looks really cool. You can download Lighthouse Cams here from MacUpdate. got this widget a long time ago and couldn't understand or come up with any logical reason of why I or anybody would want/use this. can someone explain this one to me? just a tad tired of the majority of these tips being widget finds also. Surely the lighthouse widget is useful for people in coastal areas, but I guess it would depend on your prevailing weather patterns. Down here in West Australia, it would be good to see the cold fronts coming in. I just downloaded this widget and I DON'T live on the coast (but I wish I did!) It reminds me of all the vacations I've taken with my family over the years to various beaches on the East and West coast. It might not be for everyone, but I love it! It's a nice break from the more "practical" widgets! Thanks! It's better to light a candle than complain about the darkness (old Chinese proverb)! surfers are interested in local conditions as are boaters and sailors. I think light houses are cool.